Since its establishment in 2013, a total of 146 posts have appeared on the Center for Political Studies (CPS) Blog. As we approach the new year, we look back at 2018’s most-viewed recent posts. Listed below are the recent posts that you found most interesting on the blog this year. The 2016 election campaign seems to many to have been one of the most negative campaigns in recent history. The authors explore negativity in the campaign – focused on debate transcripts and Facebook-distributed news content – and share their observations. In almost half of two-parent households in the United States, both parents work full-time. Yet when a baby is born, it is still new moms who take the most time off work. On average, new mothers take 11 weeks off work while new dads take just one week, according to a 2016 survey carried out by the Pew Research Center. In part, that is because many new fathers in the U.S. don’t have access to paid paternity leave. Paid maternity leave is rare, too: in fact, the U.S. is the only developed nation that does not provide a national paid family leave program to new parents. By closely investigating all known cases of state-backed cross-sector surveillance collaborations, the authors’ findings demonstrate that the deployment of mass surveillance systems by states has been globally increasing throughout the last twenty years. More importantly, from 2006-2010 to present, states have uniformly doubled their surveillance investments compared with the previous decade. Since 1948, the ANES- a collaborative project between the University of Michigan and Stanford University- has conducted benchmark election surveys on voting, public opinion, and political participation. To learn more about the study, we asked Ted Brader (University of Michigan professor of political science and one of the project’s principal investigators) a few questions about the anticipated release. The American National Election Studies (ANES) has surveyed American citizens before and after every presidential election since 1948. The survey provides the public with a rigorous, non-partisan scientific basis for studying change over time in American politics. The interactive graphs in this post illustrate the changing American electorate and some of the factors that may motivate voters’ choices at the ballot box. Election forensics is the field devoted to using statistical methods to determine whether the results of an election accurately reflect the intentions of the electors. Problems in elections that are not due to fraud may stem from legal or administrative decisions. Some examples of concerns that may distort turnout or vote choice data are long wait times, crowded polling place conditions, bad ballot design and location of polling stations relative to population. In a paper presented at the 2017 APSA meeting, Arthur Lupia, University of Michigan, and Anne Norton, University of Pennsylvania, explore the effectiveness of deliberative democracy by examining the foundational communicative acts that take place during deliberation. Dr. William Elliott contends that we need a revolution in the way we finance college education. His new book Making Education Work for the Poor, written with Melinda Lewis, takes a hard look at the inequalities in access to education, and how these inequalities are threatening the American dream. Elliott and Lewis present data and analyses outlining problems plaguing the system of student loans, while also proposing children’s savings accounts as a robust solution to rising college costs, skyrocketing debt burdens, and growing wealth inequality. In a presentation at the University of Michigan on October 3, 2018, Elliott presented new research supporting the case for children’s savings accounts and rewards card programs. This entry was posted in ANES, APSA, Elections, Gender, International, National, Policy, Race on December 17, 2018 by Katherine Pearson. Is policy driven by the rich, or does government respond to all? Post created by Catherine Allen-West based on research presented by Benjamin Page and Christopher Wlezien at the Center for Political Studies Interdisciplinary Workshop on Politics and Policy. With the U.S. Presidential Election just a day away, both campaigns have amped up their rhetoric to solidify support among their bases. Hillary Clinton is making her case for bringing America together and Donald Trump is using his platform to rally against a rigged system. Trump’s claims of a rigged, or out-of-touch, political system seems to resonate with his base, a group of Americans that feel ignored and underrepresented by their current leaders. These sentiments are not just unique to Republicans. During the primaries, Bernie Sanders gained mass appeal with progressive Democrats as he trumpeted the idea that wealthy donors exert far too much influence on the U.S. political system. Benjamin Page, Northwestern University Professor of Decision Making, and Christopher Wlezien, Professor of Government at the University of Texas at Austin, have both conducted illuminating research on the influence of affluent Americans on policy change. Recently, Page and Wlezien discussed their latest findings at the University of Michigan’s Center for Political Studies. The two scientists drew on results from their own work as well as analysis of data from Martin Gilens. The Gilens data is unique, in that, it documents public opinion on 1,800 issues from high, middle and low income groups over a long period of time (1964-2006). Page and Wlezien looked at the same data but the results of their analyses produced two opposite viewpoints. Page contends that when it comes to policy change, average citizens are being thwarted by America’s “truly affluent”- multi-millionaires and billionaires- who are much more likely to see their preferences reflected in policy decisions. By comparison, Wlezien suggests that there isn’t pervasive disagreement or major inequality of representation between groups and that a large driver of policy change is the convergence of preferences between groups. In other words, when groups agree on an issue, policy change is most successful. First, it’s important to know what the Gilens data says about how much influence an average American has on policy. According to Page, average citizens have little influence even when a policy is clearly supported by a majority of Americans. He illustrated his point with the graph below. 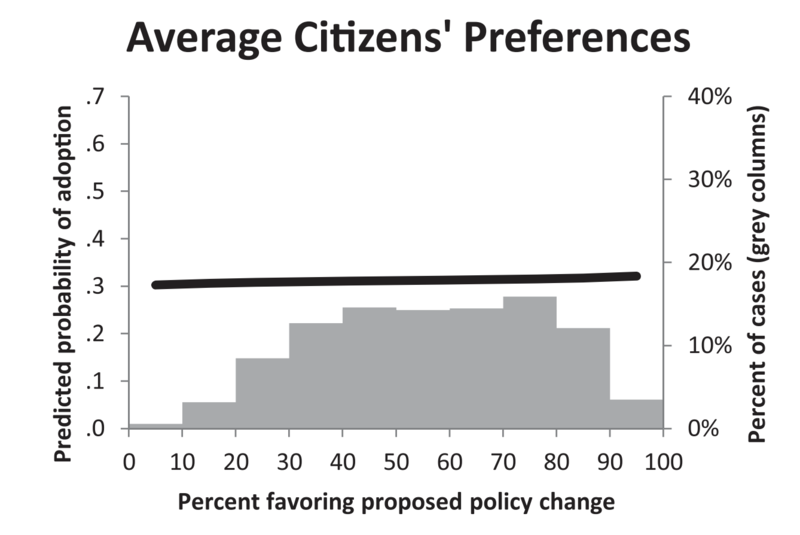 Even when 80% of average Americans favor a policy change, they’re only getting it about 40% of the time. Predicted probability of policy adoption (dark lines, left axes) by policy disposition; the distribution of preferences (gray columns, right axes). Source: Gilens, M. and Page, B.I. (2014) ‘Testing Theories of American Politics: Elites, Interest Groups, and Average Citizens’, Perspectives on Politics, 12(3), pp. 564–581. doi: 10.1017/S1537592714001595. This is extremely important, Page says, because “in a changing world when policy change, in many people’s minds, is really needed on a whole bunch of areas” the public’s influence is being thwarted in a major way. 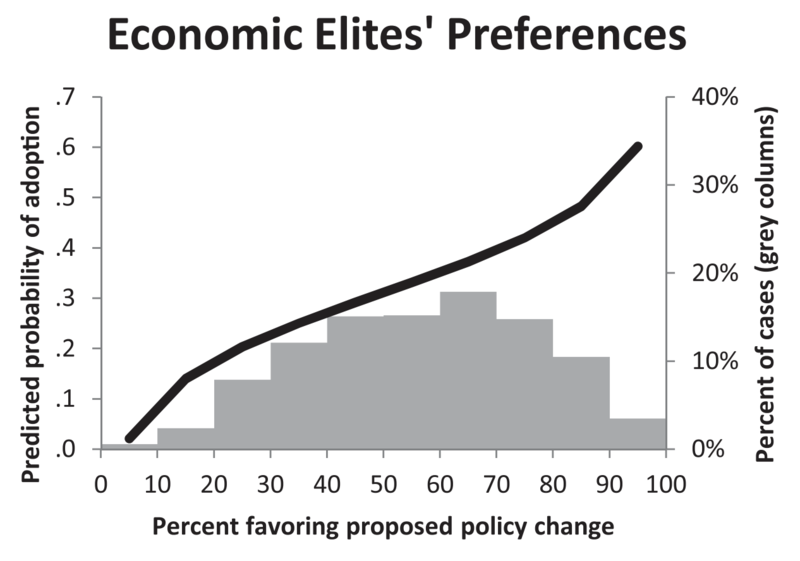 Furthermore, Page argues that a small group of top income earners in America are more likely to see their preferences reflected in policy change, by a large margin. Source: Gilens, M. and Page, B.I. (2014) ‘Testing Theories of American Politics: Elites, Interest Groups, and Average Citizens’, Perspectives on Politics, 12(3), pp. 564–581. doi: 10.1017/S1537592714001595. 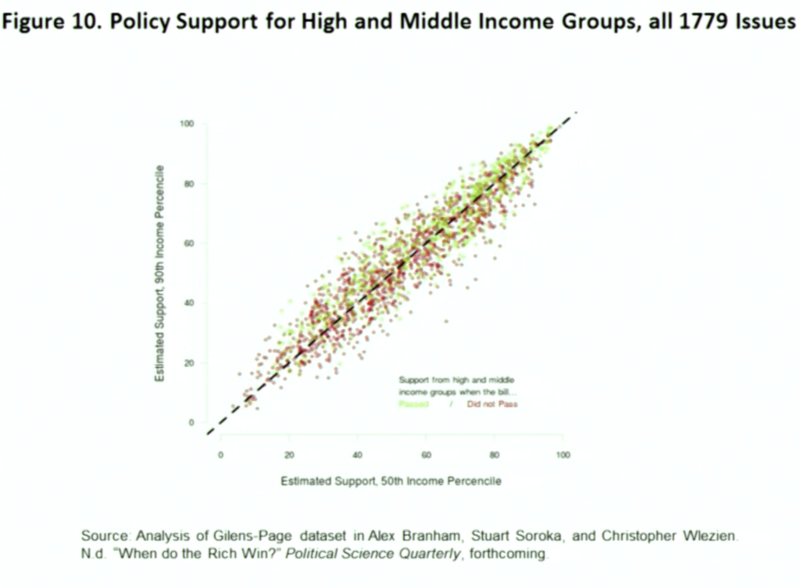 Policy Support for High and Middle Income Groups: Wlezien found, that across all of the issues from the Gilens data, there is little disagreement or inequality between group preferences reflected in policy change. That’s not to say there’s total equality among all income groups. According to Wlezien’s analysis, it’s the poor who are losing out most of the time when it comes to their preferences being reflected in policy change. 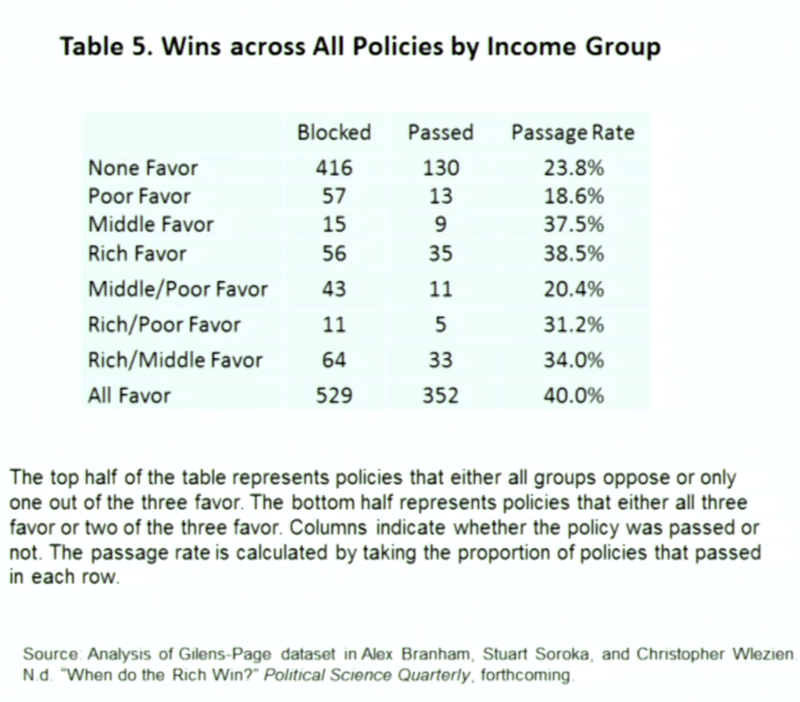 In fact, when the poor by themselves favor a policy, it has the lowest rate of success at 18.6%. To put that in perspective, when NO ONE favors a policy, the policy still has a 23.8% passing success rate. This is a recurring theme. As Wlezien points in the clip above, middle and high income group policy preferences are relatively similar most of the time, the real difference is between those two groups and the lower income group. If it’s the case the average Americans agree with affluent Americans a majority of the time, maybe their lack of influence doesn’t matter that much. If ordinary Americans are getting what they want a good amount of the time, should they care if the affluent truly do wield more influence? Furthermore, Page argues that what “the truly wealthy”- multi-millionaires and billionaires -want from government policy is quite different from what average people do. While Page and Wlezien clearly offer two different takeaways from this data, they both agree that the influence of money in politics deserves further research to parse out who, if anyone, is being thwarted by the current political process and to identify the ways all citizens can ensure that the government responds equally to their needs. Book: Who Gets Represented? Peter K. Enns and Christopher Wlezien, editors, Russell Sage Foundation. “Critics argues with our analysis of U.S. political inequality. Here are 5 ways they’re wrong” by Martin Gilens and Benjamin Page, Washington Post, May 23, 2016. Gilens, M. and Page, B.I. (2014) ‘Testing Theories of American Politics: Elites, Interest Groups, and Average Citizens’, Perspectives on Politics, 12(3), pp. 564–581. doi: 10.1017/S1537592714001595. This entry was posted in Policy on November 7, 2016 by Catherine Allen-West.